You will notice right away that White Night uses a black and white color palette that clearly offers a very stylized look. While we have all seen this style used many times before, what can't be gleaned from a quick glance is the fact that this game uses its minimal color choice to its advantage by implementing plenty of mechanics that are dependent on the way light is shone in your immediate environment. So instead of jumping on the bandwagon and using a black and white theme for what is now considered an easily created look that covers up imperfections, OSome Studio has chosen to build their game around this color choice and in doing so has the clear advantage of being able to use it in a unique way that presents some very clever puzzles to the player. 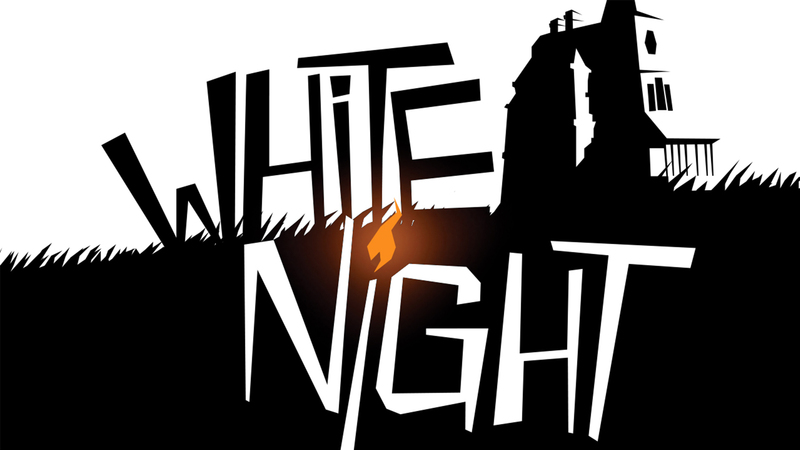 Considering that White Night is a survival horror game similar to many of the classics released in the early 2000s, you can expect sluggish character movement, fixed camera angles, and an emphasis on very limited supplies. To some, this may be precisely how a survival horror should play, but to others, this can be a real hindrance to their enjoyment. First and foremost the controls are what will be the most grating issue for the majority of players. Unlike the PC version, the point and click movement can be a real pain since we are now playing on a touchscreen device. Often I find my taps on the screen do not correlate with where the protagonist moves. This is in part because it's difficult make out obstructions in your path thanks to the black and white color scheme that can hide them. The fixed camera only serves to exacerbate this issue. While controls may be less of an issue on tablets thanks to a bigger screen that results in easier navigation, you will find that movement in particular instances where you need to get close enough to an object that requires inspecting can often be an annoyance because you can't get the character close enough to interact with it. Usually, this is not the case, and the game works as intended, but when you do come across this problem you will see what a pain it can be. Despite some wonky controls and unclear paths in your environments made worse by a fixed camera, I have to say everything else about this release is pure gold. The voice work is phenomenal. The noir theme of the game comes through with every melancholic lines voiced by the game's narrator and protagonist. If you enjoy cynicism, fatalism, and moral ambiguity, this is most definitely the game for you. Then you have the main plot to consider. After falling victim to a car crash caused by avoiding a strange woman in the street you find yourself injured and ambling your way up to a creepy mansion atop a hill in order to find some help. This plan, of course, does not work out in your favor as you will soon be trapped inside of a creepy house that is clearly filled with apparitions that can only be forced away through using light to your advantage. As for the graphics, it is pretty clear that they offer a very stylish look that is for the most part accessible short of the few control issues it causes. While some may consider developing black and white games a clear cheat over creating something with high-resolution textures, you still have to admit that the look is very fitting for a noir survival horror game. Plus, the fact that in this instance the minimal look offers up some exciting mechanics and puzzle solving highlights that it undoubtedly doesn't hurt to use what is often an arguably exhausted styling. Now, when it comes time to dive into the gameplay, I would say White Night is a clear throwback to simpler times. Much like the first few titles in the Resident Evil or Silent Hill series of games, you will be navigating your way through small corridors and rooms looking for items such as matches to light your way through the dark and keep you safe from the apparitions that haunt the house. Many of the starting puzzles will have you solving ways to light the rooms you find yourself in as you search for clues, which is a slow process that requires the few matches you find while searching about. The quicker you can get the lights on the less you have to worry about running out of matches. So trust me when I say that item management is key. Another highlight of this release is the fact that it's a fully paid upfront title. For $4.99 you get the entirety of the game without having to worry about any advertisements or in-app purchases to pull you out of your immersion. You can also expect Google Play Games Services to be supported with the inclusion of an achievement system, though there is sadly no support for cloud saving or leaderboards. And honestly, for a paid game it is disheartening to see that cloud saves are not supported by default at this point as I am sure many of us would enjoy being able to pick up where we last left off on the different Android devices we play on. All in all, I would say White Night offers up a frightening experience that exudes a ton of charm thanks to its clear noir laden story and visually superb black and white theme. While the controls can be a pain to work around at times, it is not an uncommon problem found in the games that clearly inspired this release. So sure, maybe this is too close of a facsimile to those classics as it does retain some of their more notable control issues, but that may be precisely what sets White Night apart from the more modern (and in my opinion stale) titles in the survival horror genre. So yeah, if you have a hankering for a classic survival horror experience on Android, look no further than White Night.